In early spring, ANOVA (formerly Women’s Community House/Sexual Assault Centre London) had the great pleasure of hosting two staff members from Mountain Rose Shelter in Rocky Mountain House, Alberta. This was an opportunity that came through the Women’s Shelters Canada. They offered to facilitate two shelter exchanges which involved four shelters from across Canada. Terry and Leslie spent their week in London touring all of our programs and services along with many other fabulous women’s services in and around London. Next week, two of ANOVA’s staff members, Ruth and Mary, will fly out to Rocky Mountain House to meet up with our sisters there and to learn more about their services. I had the pleasure of spending a considerable amount of time with Leslie and Terry and, although our communities and our services vary in size and scope, we do fundamentally share the same dreams for creating communities that are free from violence. I sure do hope that we have more opportunities like this one so that we can build a stronger network of shelter services from coast to coast to coast. 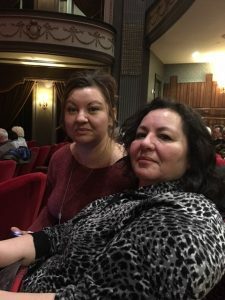 * Photo taken of Terry and Leslie at The Grand Theatre who kindly provided us with complementary tickets to one of their productions.